Style 35th Anniversary: Ancient History in a Blink | Back Page | Style Weekly - Richmond, VA local news, arts, and events. If you were around when Style was launched, you're ancient now, like me. Thirty-five years ago, a free paper with the added benefit of quality content, not just advertising, was preposterous. Free paper? Tabloid newsprint? Supermarket racks? "We've seen these things come and go," an old dude at the defunct Richmond News Leader man-splained to me. I would get a lot of 'splaining over the next decade and then some — largely because I was building a business with no background, knowledge, financing or patronage, and I wasn't the most likely choice, either, in regards to age or gender. These days, of course, it's different. I would simply move in with my parents, start a GoFundMe page, get me a mentor and audition for "Shark Tank." This would have been equally preposterous. We were merely a garage band with big aspirations and scant training. Imposters. Least likely to succeed. Yet it wouldn't take long to recognize our great advantage: We were fearless, intoxicated by an exciting end goal we could almost touch. As resolute, passionate entrepreneurs, we were eager to invent, to understand and analyze, to deconstruct, discard and recast. This creative process did not exist at the two dailies or three networks, stuck in the "we've always done it this way" mode. (In fairness, it didn't exist in any business of that size in the '80s.) We were on the right path, a new path, and we knew it. That time we named names when we shouldn't have. That time we experimented with a really cool-looking postmodern cover, inadvertently turning a local black politician into something out of a minstrel show, which he roundly and rightly resented. That time we mischaracterized that poor arts administrator. That time, all those times, we caved to advertisers and made stories out of promotions. That time, sometimes, we were flat-out wrong. That time we ruined Cotillion. I'm still so very sorry. Happily, though, and often by accident, we stumbled early on to some keys to success. Recall, it was the nascent '80s when yuppies roamed the earth conspicuously consuming clothes, furniture, jewelry and burgers served in fern bars. Retailers burned to reach them. So, tandem to designing a publication that would go deep into the culture all around them, we had to locate the area's upscale, which was then a new term, affluent readers. We followed the money. This was not hard. Using highly sophisticated market research like the 10-year-old census, we identified the neighborhoods with the desirable household incomes by ZIP codes, which were right where we all knew they were. Brilliant! Then, we hired high school kids to run through these tony neighborhoods depositing 16, 20 or 24 pages of inky newsprint on the doorsteps of people who had money to spend at Carreras. Voila! Target marketing! Easy peasy, with none of the expense and bother of direct mail — except rich people didn't take to young people running through their yards stomping on their velvet green lawns, and they especially didn't like it when the papers blew around and trashed the hedges. (Indulge me here to stop and kindly thank Randy Wyckoff, once again, for taking command of this protean effort.) When we had enough money, we bought newsstand racks and set about begging Ukrop's to let us put them in its stores, but that's a story for another day. The real fun was content. We would continually study what our readers didn't have but we decided they wanted, shamelessly lifting ideas from hot, hip publications like New York Magazine and the Village Voice. The core became a big, fully-loaded arts, culture and entertainment calendar about the obvious, the overlooked and the obscure. A magazine-style vertical layout and attention to photography and graphic design enabled us to turn ads into art, stretching the boundaries of the tabloid format. As we grew, we learned to anticipate trends and habits, question assumptions, cover the issues worth following in our less than humble opinion, bash a few institutions. We were often being 'splained to. Eventually, we got better, much better. "You Are Very Richmond If …" poked fun at the outdated pink and green palette of the day; "Richmonder of the Year" gave us a chance to applaud one of our own. Readers eagerly awaited news of who was on the cover of "the Style" as we anointed the people to watch, thereby turning local movers and shakers into heroes, legends and dinner table conversations. The Back Page became a forum for beautiful writing by Garrett Epps, Hal Crowther and a steady stream of budding essayists. This brings us to the present, where headline news has been replaced by Twitter, Instagram is the new society page aka Whirl of Richmond (you really have to be old to get that), and Facebook is everyone's go-to calendar. 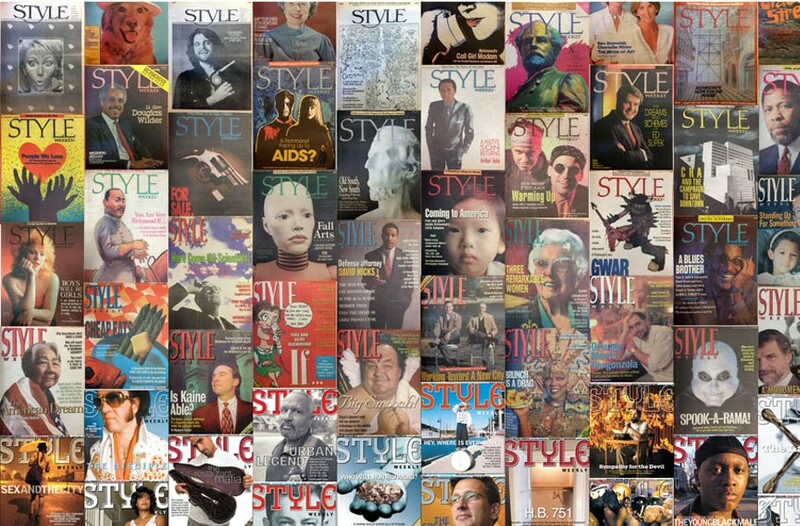 Thanks to dozens and dozens of talented people over all these many years, Style Weekly is still here alongside them, intact and always going for it. I am glad to have been there at its inception. Three advertisers from the inaugural issue remain in business: Coppola's, Richmond Memorial Hospital and Reynolds-Minor Gallery, which would become Reynolds Gallery. Lorna Wyckoff is the founder of Style Weekly and its publisher and editor from 1982 to 1993. She writes occasionally and consults with nonprofits and budding entrepreneurs.